I think it’s time for another savory #Appleweek recipe, don’t you? This summer was absolutely the summer of grilling for us. I can’t even tell you how much charcoal we’ve went through since May. I initially wanted to grill these sausage skewers right on the pan for you, but Mother Nature and I have been in a bit of a tiff. You see, I don’t like rain and she absolutely loves it. Five separate times I tried to grill this recipe and each of those five times it poured. Then I figured it was probably better to make these in the oven anyway and set about to making that new plan happen. I changed up my idea of a glaze and got to work getting everything prepped. 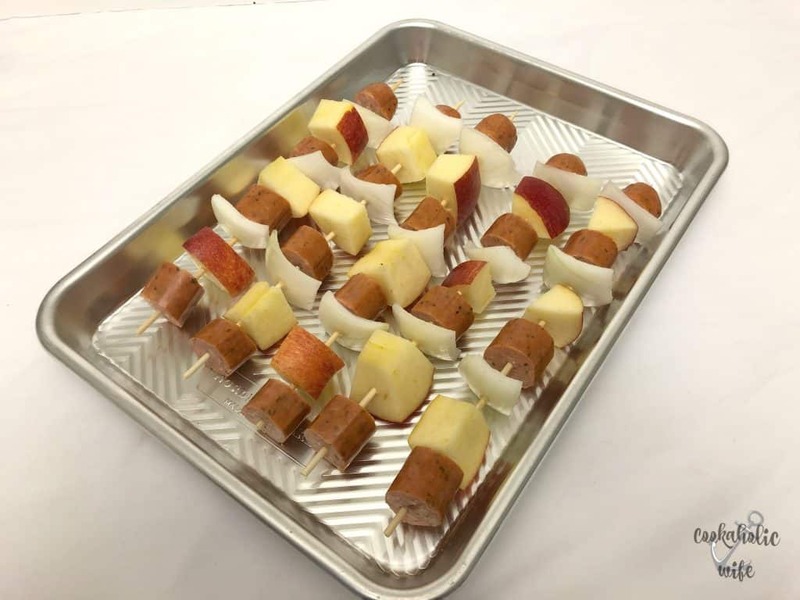 Apples, sausage and onions are skewered and covered in a grainy mustard-maple syrup mixture and cooked on a sheet pan, perfect for those rainy days or if you just don’t own a grill. 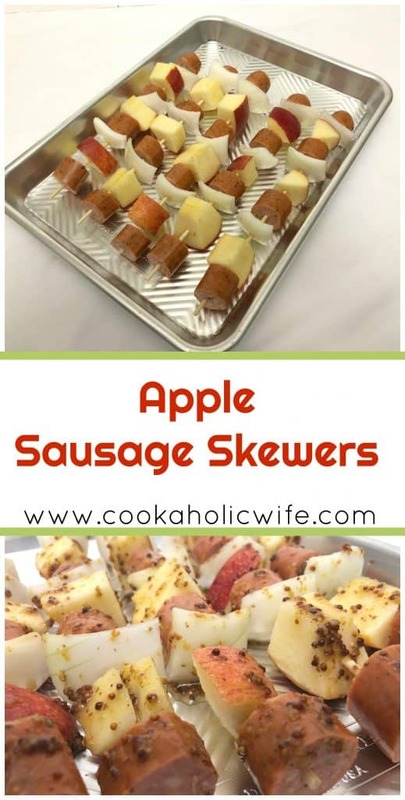 Add a piece of sausage, followed by an apple piece and an onion piece onto the skewer. Repeat until skewer is full. Repeat again with remaining skewers. Whisk together the whole grain mustard and maple syrup. Place the skewers onto the sheet pan and brush the mustard mixture on top. Bake for 20-25 minutes or until apples are fork tender. 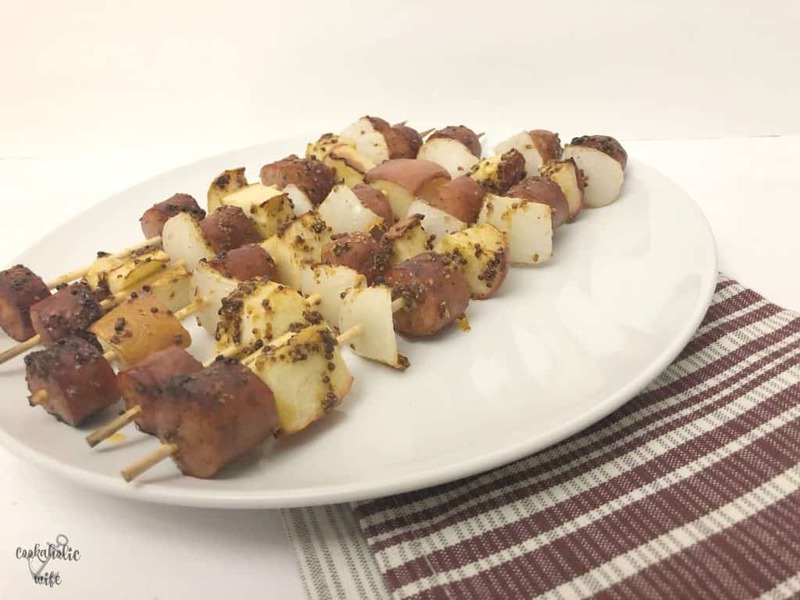 Recipe uses 4-6 skewers, depending on size. If you do not have a non-stick sheet pan, cover it with foil prior to placing the skewers on it. For this event, I was given a Prism Baker’s Bundle Quarter and Half Sheet baking pan from NordicWare. NordicWare says that the pan is non-stick and I decided to really put that to the test by using a glaze that included maple syrup. There isn’t much stickier than baked on maple syrup. And I am happy to report that I took the skewers off the pan, sat the pan in soapy water and came back three minutes later and the stuck on maple syrup and onion bits just wiped right away. Some call it non-stick, I call it wonderful kitchen magic. These skewers are delicious! They reminded me so much of fall! 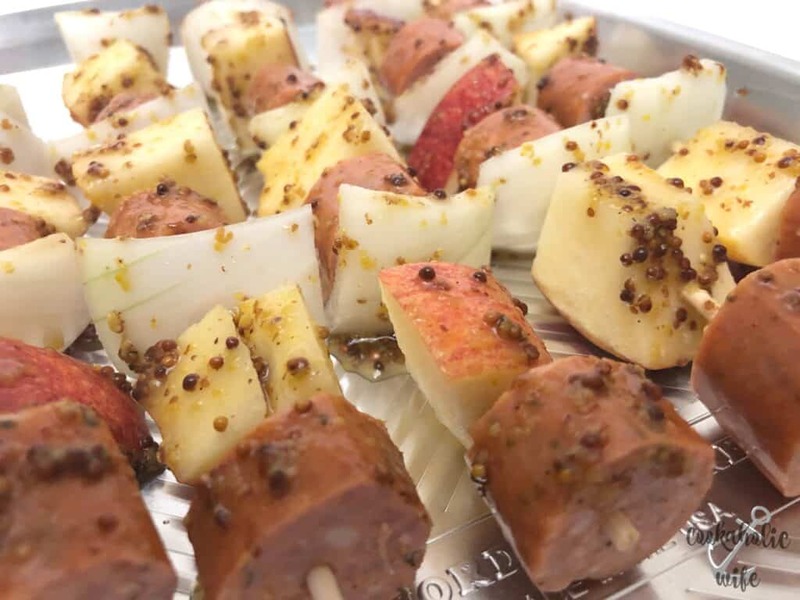 I chose to use a fully cooked sausage which I think is a little easier on the skewering front, but feel free to use whatever you have on hand. Thank you so much NordicWare! I can’t wait to keep using these awesome pans! Good choice, slathering them with the whole grain mustard.